AquaNeat is a nonselective herbicide for control of cattails, brush and weeds that grow out of the water. It is not effective on plants that grow under the water, spray onto the foliage of the plant and it kills the plant and roots. 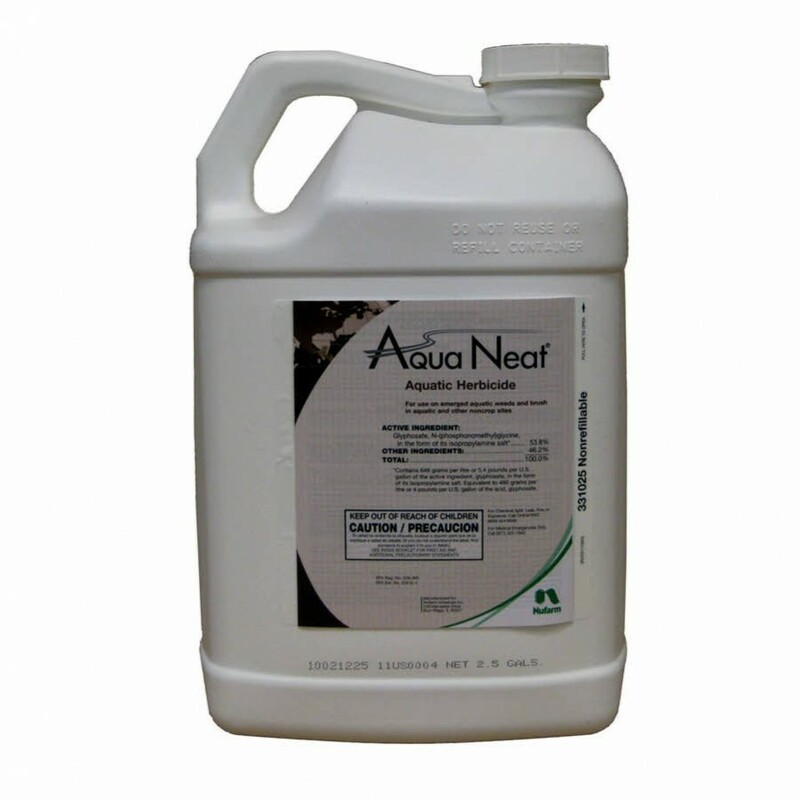 For non-selective aquatic weed control, nothing beats Aqua Neat®. Aqua Neat controls almost 200 species of emerged weeds, including a wide range of broadleaf weeds, sedges and annual and perennial grasses, in and around flowing or stagnant fresh and estuaries or brackish water. Aqua Neat gives managers the convenience to control weeds in public, agricultural, commercial or residential settings. Must be used with activator or surfactant like our Cygnet Plus Activator Surfactant or similar surfactant.Apply with sprayer at two ounces per gallon of water, may require a second application. Effectiveness may be reduced if rain occurs within six hours of treatment, results will begin to show in two to four days but can take as long as two weeks. Annual weeds: Apply to actively growing annual grasses and broadleaf weeds. For broadcast applications, use 1-1/2 pints of Aqua Neat per acre plus 2 or more quarts of a nonionic surfactant per 100 gallons of spray solution if weeds are less than 6 inches tall. If weeds are more than 6 inches tall, use 2-1/2 pints per acre plus 2 or more quarts of an approved nonionic surfactant per 100 gallons of spray solution. For hand-held, high-volume applications, use a 3/4 percent solution of this product in water plus 2 or more quarts of a nonionic surfactant per 100 gallons of spray solution and apply to foliage of vegetation to be controlled.